In terms of hardware, you need an Intel-based Macintosh running Mountain Lion (OS X 10.8) or later. Regarding software, you need Xcode 8.x since that is the current version to include Swift 3. You can download Xcode from the App Store or Apple’s developer web site at http://developer.apple.com. 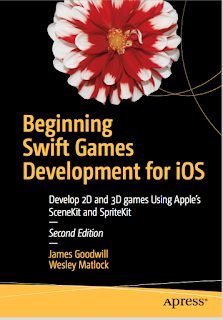 In Chapter 1, you’ll learn about what Sprite Kit is and how you create a new Sprite Kit game using Xcode. You will then dive in and create the beginnings of a Sprite Kit game starting from scratch. You will learn about SKNodes and their subclasses, and you’ll use an SKSpriteNode to add both a background node and a player node. In Chapter 2, we will step back a bit and give you a deeper look at Sprite Kit scenes, including how scenes are built and why the order they are built in can change your game. The chapter will close with a discussion of Sprite Kit coordinate systems and anchor points as they relate to SKNodes. In Chapter 3, you’ll work with Sprite Kit’s physics engine and collision detection. The chapter will begin with a discussion of SKPhysicsBody—the class used to simulate collision detection. You will then turn on gravity in the game world and see how that affects the nodes. After that, you will add a touch responder to propel the playerNode up into space, and finally you will learn how to handle node collisions. the player is flying through space collecting orbs. Finally, you will start using the phone’s accelerometer to move the player along the x-axis. In Chapter 5, you’ll refactor the orb node’s layout one last time with the goal of enhancing playability. After that, you will learn how you can use SKActions to move an SKSpriteNode back and forth across the scene and then make that same node rotate forever. The chapter will close with a look at how you can add colorizing effects to an SKSpriteNode using a colorize action. In Chapter 6, you’ll see how to define particle emitters and how to leverage them in Sprite Kit games. After that, you will learn how you can use them to add engine exhaust to the playerNode whenever an impulse is applied to the physicsBody. In Chapter 7, you’ll see how you can use SKLabelNodes to add text to your Sprite Kit games. Specifically, you’ll see how you how to add a label that keeps up with the number of impulses remaining for the spaceman to use, and then you’ll see how you can add scoring to the game to keep up with the number of orbs the spaceman has collected. In Chapter 8, you’ll learn how to implement scene transitions using Sprite Kit’s SKTransition class. You will look at some of the different types of built-in transitions Sprite Kit makes available to you. You will also see how you can control each scene during a transition. At the end of the chapter, you will take your newfound knowledge and add a menu scene to your SuperSpaceMan game. In Chapter 9, you’ll learn some Sprite Kit best practices; specifically, you will see how you can create your own subclasses of SKSpriteNode so that you can better reuse your nodes. You will then move on to changing your game to load all the sprites into a single texture atlas that you can reference when creating all future sprites. After that, you will move on to externalizing some of your game data so that designers and testers can change the game play. Finally, you will close out the chapter when you prune your node tree of all nodes that have fallen off the bottom of the screen. 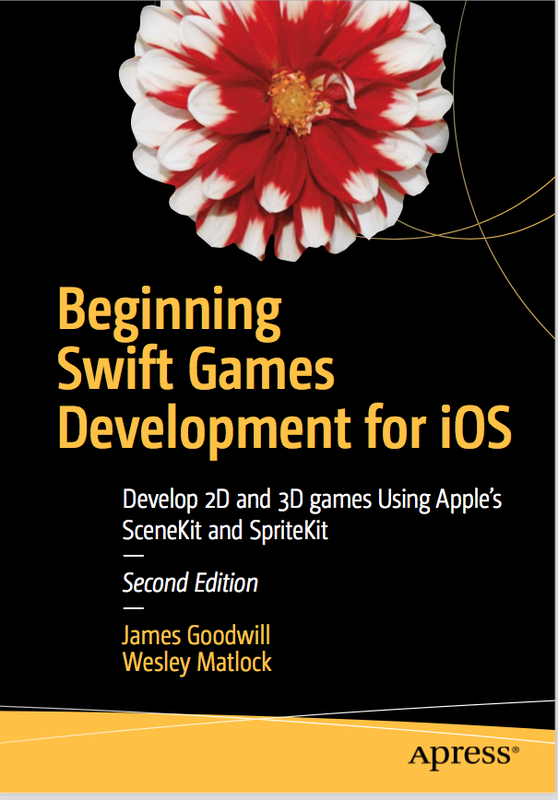 In Chapter 10, you’ll learn about what Scene Kit is and how to create a new Scene Kit game using Xcode. You will then dive in and create the beginnings of a Scene Kit game starting from scratch. You will learn to about SCNScene and SCNodes with a Scene Kit primer. In Chapter 11, you’ll learn more about the scene graph and some of the basics of Scene Kit. You will start to create your game by loading the spaceman from his Collada file. You will also learn about the Scene Kit primitive geometries by adding these as objects for the spaceman to avoid. In Chapter 12, you’ll learn how Scene Kit uses lighting and the type of lighting that is available to you in Scene Kit. You will also examine how materials are added onto the SCNNode, as well as how the camera is used within the scene. In Chapter 13, you’ll learn about the basics of animating the objects in your game. You will see a couple of different ways to animate the nodes to give you more than one way to do your animations. Once you have completed this chapter, all your objects will move within the scene. In Chapter 14, you’ll learn about collision detection within the scene. You will learn how to move the spaceman around the scene. Once you have the spaceman moving, you will learn how to detect when the spaceman runs into an obstacle. In Chapter 15, you’ll learn how to use a Sprite Kit scene within the Scene Kit scene. The chapter will show you how to create a screen to show you a timer that you will start when the user starts the game. The chapter will also show you how to display a “game over” screen and then restart the game. In Chapter 16, you will learn the basics of the SceneKit Editor. This chapter will give you a basic understanding of creating a scene and various nodes visually in the editor. No coding will be done, but rather drag and dropping nodes and using the various editors to manipulate the objects.